Cumberland Glass, Framing by Carol, Bill Parker Carpet Service, Sonny’s Auto & Truck Repair, WERK & WMTN Radio Stations, Trade Center/Sonic Emporium, Roger Yount Body Shop, Pizza Cottage, McDonald’s Restaurant, K & J Auto Sales, Waste Industrials, and Lowland Credit Union. 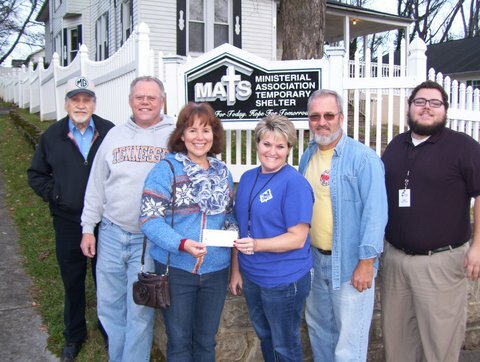 As a result of these efforts, we were able to raise over $1,700 for the Daily Bread. "Here we are with Hobe Williams (Daily Bread ) and Liz Justiss (M.A.T.S) They were very appreciative and you would have thought we had just given them a thousand dollars." 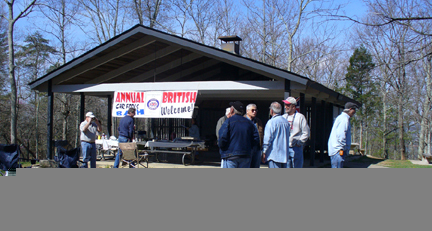 ETMGDC co-hosted the Eighth Annual British Car Fools Bash in Maryville, TN this year. Club members attended the event, joined by British Car enthusiasts from around the area to kick off the new driving season. More here! 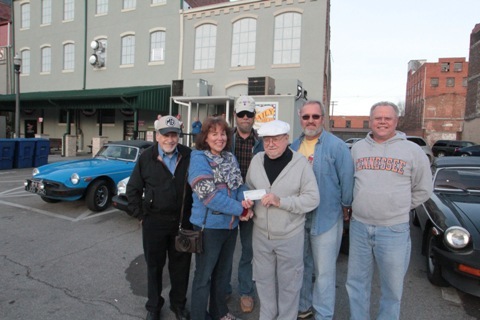 Members of ETMGDC enjoyed drive held by the Appalachian British Car Society. Pics and details on ........Past Events page! Annual drive and picnic at Paint Creek. For more details see the Past Events page. Our annual Hot Springs drive and picnic was attended by several members. For more details, see the Past Events page. Several of our members attented and this enjoyable event. For more info on this event, please see the Past Events page. Mark and Karyn Bourne led us on a drive to a delightful picnic spot deep in the Cherokee National Forest. To view pictures and read about it, go to the Past Events page. Chuck & JoAnn Hamilton again led us on our annual drive to picnic at Hot Springs, NC. Read more and see pictures on the Past Events page.